Fans of British comedy actor John Cleese have produced a book to celebrate the star’s birthday, with all proceeds going to charity. The book features a selection of contributions to the official John Cleese forum, with proceeds going to charities such as Amnesty International and the Prince's Trust. 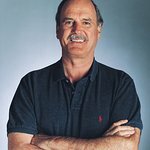 “I am touched that you are donating proceeds from the book, and the digital download of the book, to my favourite charities,” Cleese said to the creators of the book. "And why have you gone to all this trouble? Because you wanted me to have a good laugh on my 70th birthday. Though it was more than six months ago, I do appreciate the illustration of tardiness on the book jacket. To find out more and order your own copy, click here.